Should Cake Flour Be Sifted Before Measuring? Gel frosting works well for decorating cakes or glazing pastry. 2 What Can You Use Instead of Powered Sugar for Frosting? 4 Should Cake Flour Be Sifted Before Measuring? Gel frosting, commonly called piping gel, is a shiny decorating gel made from corn syrup used for everything from writing messages to adding a glaze over pastries. The tubes of colored piping frosting sold in the grocery store baking aisle are most often colored piping gel. Clear piping gel is sold in bulk containers, which you can tint with gel or powdered food coloring to achieve any color. Piping gel frosting works well for writing all kinds of messages on cakes, from "Happy Birthday" to "Congratulations." If you buy it pre-tinted in a tube, it usually requires you to simply snip off the tip. Use a disposable decorating bag and a small, round decorating tip if you color your own clear piping gel. Write the message just as you would when writing with a pen, but move slowly so the gel frosting lies properly on the cake. Substitute gel frosting for regular buttercream frosting when you want a shiny, glossy finish that makes cake decorations stand out. Blue gel frosting gives water features a shimmering, wet look, while colored gel frosting outlined with black gel frosting can look like stained glass. A character decoration stands out with a nearly three-dimensional effect when piped with gel frosting over a matte buttercream background. 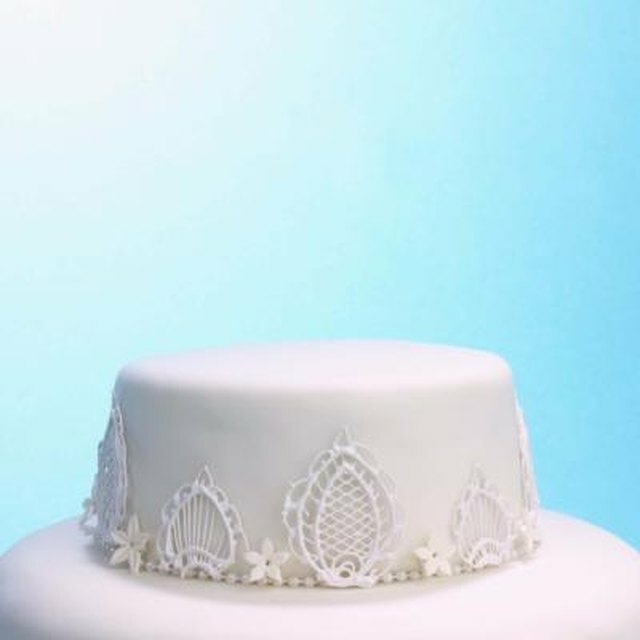 Intricate patterns and designs are difficult enough to achieve with pen and paper and are even more difficult when trying to draw them on cake with frosting. Lay a piece of parchment paper or wax paper over a printed design and trace over the lines with piping gel. Flip the parchment paper over on top of the cake. Trace over the lines with a toothpick to push the piping gel off onto the cake. The printed image must be reversed or mirrored to transfer in the desired direction, especially if working with letters or numbers. Whipped cream is an emulsion that separates back to liquid state within minutes, so it must be stabilized to be useful for decorating cakes. Piping gel is one of several methods for stabilizing whipped cream so it holds piped shapes. Mix about 2 tablespoons of piping gel into every 1-1/2 cups of whipped cream. Shiny crust on pastries is often achieved with an egg wash before baking or by brushing sugary glaze over the finished pastry, but you can also use piping gel frosting to glaze pastries. Brush clear piping gel directly over the baked pastry while it is still warm. Do this for everything from Danish pastries to fruit tarts. A bit of piping gel applied to the back of fondant and royal icing decorations acts as a glue to bind the decorations to the cake. The cake must first be frosted with a base layer of buttercream frosting. You can cover the cake with fondant, if desired. Use a small artist's paintbrush to brush a thin layer of piping gel on the back of the decoration and press the decoration gently onto the cake. Similarly, you can brush clear piping gel over a cookie and sprinkle colored sugar to decorate the cookie.